What dangerous animal can smell a seal colony from 2 miles (3 kilometers) away? Here's a hint...they are known to attack humans who they mistake for seals when searching for prey. If you guessed the Great White Shark, you are correct. Although this massive predatory fish prefers to live in coastal regions where the temperature is more mild, they are also known to live in colder habitats as well. Read on for information on the largest Great White ever caught, facts about how sharks breed, and why their upper bodies are slate grey. This information is written for both kids and adults. Click here for a great selection of Amazon.com books about Great White Sharks. There aren't many predators that the Great White has to be wary of, but even the largest and most ferocious Great Whites need to steer clear of Killer Whales, also called Orcas. They are faster and more powerful than sharks and will deliver a powerful blow before going in for a kill-even on a Great White. Two of the largest Great Whites ever caught have been recorded at 20.3 feet long (6.1 meters) by a local resident on Prince Edward Island, Canada and 21.3 feet long (6.49 meters) off the coast of Cuba. Over the years, Great Whites have decreased in numbers partly due to natural threats but mainly due to human causes. There are some regulations and penalties for killing Great Whites but since they are not officially endangered the protection is limited. Today, their conservation status is considered vulnerable and there are believed to be less than 10,000 members of this species remaining in the world. Because of the high levels of uric acid and mercury in their bodies, a great white shark should not be eaten unless properly prepared, which includes soaking it in water for a full 24 hours before preparing it. It is not until Great whites become mature, around 15 years old, that they are able to breed. 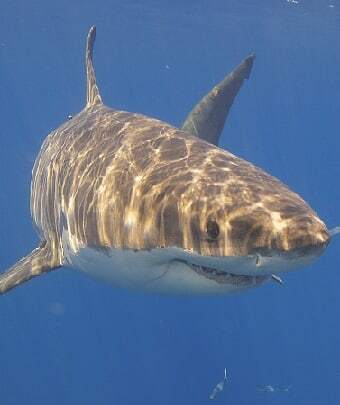 Few details are known about reproduction in the Great White; what scientists have been able to determine is that the gestation period is a little under a year. Between 2 and 12 pups are born at a time. Great Whites can live in their natural habitats for more than 60 years, but the average lifespan is closer to 30 years. Their main types of prey include all types of seals, fish, sea lions, sea turtles as well as dead and decaying whales and other sea life. They usually catch their prey at the surface of the water with a technique called breaching where they jump out of the water at high speeds. They do not have bones in their body, like other fish; instead they have skeletons made completely of cartilage. It is believed that this adaptation helps them in their ocean environment by giving them flexibility and enabling them to maneuver easily. The upper portion of the shark's body is slate grey to serve as camouflage against the sea floor. With about seven rows of serrated teeth totaling around 300 teeth at any given time, the Great White may go through up to a thousand teeth during its life. With bodies that resemble a torpedo, their streamlined shape and strong tails allow Great Whites to swim at speeds of up to 30 mph (48.2 kph).